Melissa Hertlein landed her dream job straight out of college two years ago. As a community planner with the Genesee County Land Bank, she contributes to reducing blight and improving vacant properties throughout the region. 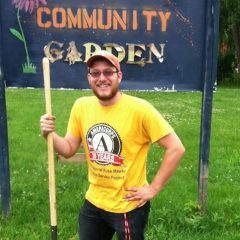 Hertlein plays a key behind-the-scenes role in mapping out and managing the group’s Clean & Green Program, which unites community groups in beautifying vacant properties throughout the county. Hertlein updates maps to reflect what needs to be done in each neighborhood, and helps coordinate the community groups that do the work. 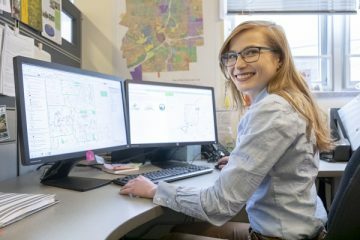 Hertlein majored in energy and sustainable systems, and environmental science and planning at UM-Flint, and earned a certificate in Geographic Information Systems (GIS). She interned at the GIS Center as a student, and was heavily involved in community projects, which included analyzing 55,000 parcels in Flint to determine vacancy rates, land bank ownership and housing conditions, and evaluation data related to more than 900 water main breaks in the city of Flint. Hertlein said GIS work helped her see data in a new way. 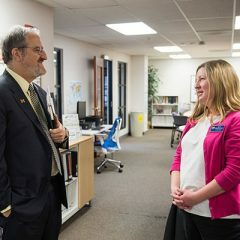 GIS Center manager Troy Rosencrants had Hertlein in classes he taught at UM-Flint, and worked with her at the center. She played an important role creating datasets for Map Flint, a community-wide online project led by UM-Flint in which researchers and the public can customize maps and access a wide variety of information from numerous sources. In 2016, Hertlein traveled with Rosencrants and Professor Marty Kaufman to Washington D.C. to participate in the White House Mapathon. The group presented GIS Center research, led by Kaufman, that analyzed the city of Flint’s hand-written records, and paper maps, and then scanned images to create a complete digital database for all the information available about lead service lines used in Flint. Hertlein was not involved in that particular research, but she was able to meet with mapping professionals from a broad spectrum of backgrounds at the conference. “Going there and working alongside the people at the conference further developed my professional confidence,” Hertlein said. Through a senior internship class, Hertlein landed a position with the Land Bank. She was offered a permanent position after graduating and has been there ever since. For her, the skills gained at UM-Flint help her daily in the work she does for the region. But she has also gained a clearer view of how the university supports community development. 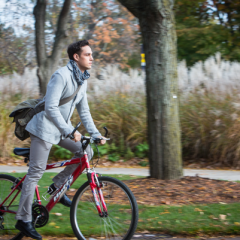 “I learned so much through my professors and the GIS Center about the dynamics within the city, and it geared me toward wanting to be in Flint professionally,” Hertlein said.